As we were in the taxi to the bus terminal in La Paz I noticed something funny about the "hippy" bag I had bought. It had a quite large hole in the side, and not the type of hole you get from overuse. It was a very precise cut designed to allow someone to insert their hand into the bag and remove anything of value from inside. It happened during our hangover day and I had not noticed a thing. Luckily the only thing in the bag was a bright orange umbrella which the robber clearly deigned unworthy of his efforts. Lucky me! Anyway kinda surprised by all this, we got on the bus for the 3 hour trip to Oruro, the folklore capital of Bolivia and home to its biggest festival, la Diablada in which people drink dance and curiously throw water filled balloons at each other for 3 days every year. However, we were there during the 362 days when the festival is not on. Footprint describes the town as functional and that is exactly what it is. Train tracks lined with market stalls run down the centre of the main street and packs of what I´m sure are homeless dogs rule the roost and have all the pickings of the rubbish. 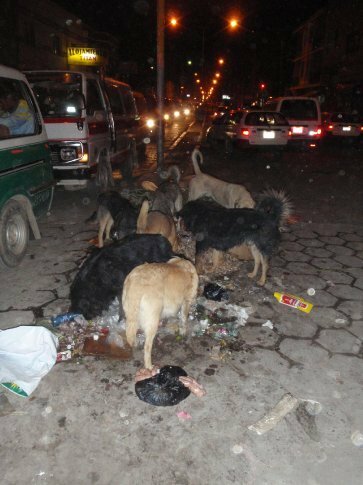 Allegedly when Evo, Bolivia´s first indigenous president was elected one of his first initiatives was to try to rid the streets of the dogs. However it was halted when the rubbish in the streets got so bad the public went on strike to bring back the dogs the do such a good job at sorting it out! We stayed in a fair hostel with "prison" beds as Claire calls them and had a fair dinner, tasty but street kids begging at the table takes some of the flavour away. We decided to get some good old Bolivian rum, which is more like a liquor, to help pass the time in the evening. The following day we went to the only thing the town has for tourists, the miners museum which is located underneath the church. We were expecting a few exhibits but it was actually an old mine shaft with lots of old mining machinery and paraphernalia on display. Bolivia, Potosi in particular held the largest deposits of silver in the Spanish Indies, and their export basically financed the Spanish empire for about 200 years. No time to lose we headed on down to the the train station to catch our train to Uyuni (Method of Transport number 16?) We were very pleasantly surprised to find that the train had a TV and showed movies which distracted us somewhat from the very juddery and bumpy seven hour ride. I have to say though that watching resident evil 3 with Spanish audio and french subtitles was a bit too much for Claire and more of a stretch than I was prepared for! It was freezing when we arrived in Uyuni at 2.30am so we hightailed it across the road to the hotel I had booked. Never was I so happy to have booked in advance as a few Irish people in front of us were turned away while we were shown to our room. OK he pointed at it and grunted but that was fine by me. Uyuni is a bit touristy but attractive and caters well for the average gringo. The next day was all about deciding which company to choose for doing the tour of the salt flats with. We had a strategy of doing internet research, picking the best ones from that and going to have a chat with at least 3 of them and doing a comparative analysis before putting money down after lunch. We ended up getting a good feeling from the first tour company we walked past who had no reviews in any guidebooks or on the internet and duly put the money down (although I hasten to add we did wait until after lunch!). We had dinner in a local place where we seem to have scared the waitress with our outlandish appearance into a catatonic state of inactivity. What seemed like hours later we emerged full, but impatient and proceeded to a place we had been told about, the extreme fun pub, for a drink. It seems to be called this because of a challenge to drink a load of shots like the "Llama sperm drink" in as fast a time as possible for the kudos of having your name on the wall. We declined the challenge but did get chatting to the barman who helped us out with a few coca mojitos (worth trying) and jokes until .... but of course a bloke from Cork with a guitar got up and started singing rebel songs with a spot of Don McLean thrown in for good measure. Actually he was very good but his girlfriend was giving him the dirtiest looks all night as she sipped her agua sin gas and he kept getting bought shots by the tour group he was with. I must also mention that as we were in the pub, early on, the bolivian army marching band (well they were bolivian, looked like the army, marched and played slightly out of tune music) gave a performance outside for about half an hour. Brilliant!